Warm fruit on cool salad! 1 Coarsely chop pistachios and toast lightly in a dry skillet. 2 Wash, dry and chop basil. Place in a bowl. 3 Wash figs thoroughly; pat dry and cut about 1/2 inch off stem end of each; transfer stems to a plate and reserve. 4 With a teaspoon, scoop out the flesh of the figs and add to the bowl with the basil. 5 Add pistachios, cheese, salt and pepper; mix well. 6 Fill the figs with the cheese mixture. Stand figs in the baking dish and top with reserved fig tops. Bake in preheated oven at 200 ° C (fan 180 ° C, gas mark 2-3) (approximately 400 ° F until softened, about 12 minutes. 7 Wash salad, spin dry and tear into smaller pieces if desired. Make a vinaigrette: whisk together vinegar, oil, salt and pepper. Dress the salad lightly and place on a plate. 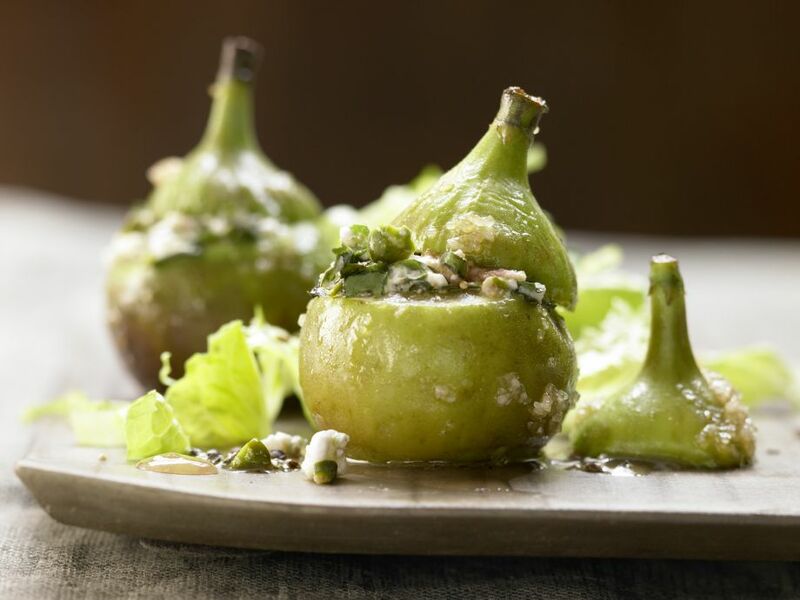 Top with figs and serve.